Eco Open Houses has been successfully run in Brighton and Hove each year from 2008. 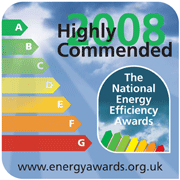 The 2008 event won a 'highly commended' award in the National Energy Efficiency Awards. Here are some reports and brochure from these events as pdf downloads. There was no brochure or report produced in 2009. These houses appeared in previous years. Several of those open this year also appeared in previous years. The Eco Renovations Techniques and Hastings Eco Projects events are also open this year, with different content. The pages include summary details and any case studies and links to suppliers that were supplied at the time.